I have a fun little DIY for you today! 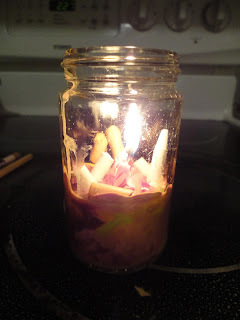 It's great if you have tons of broken candles lying around and you need to find a way to reuse them! This isn't the best smelling or burning candle, but its a really cute decorative item! So let's get started! Take your crayons and take the paper off of them. And break your crayons into small pieces so they'll melt easier. Arrange your crayons in the jar. You can layer by color, or just do them mismatched for a more "tie dye" type look. Place glass jar in microwave and microwave until crayons are slightly melted (around 2 1/2 minutes). The glass will be VERY HOT when you take it out of the microwave so use a towel or something. 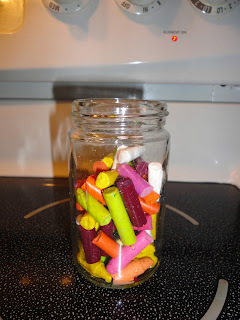 Take your wicks or birthday candles and stick them into the melted wax and hold until set. If you're using birthday candles, use 2 or 3. Make sure to put it in the center so the soot doesn't get on the sides of the glass. This candle doesn't burn well for long periods of time and it is totally more decorative than useful. 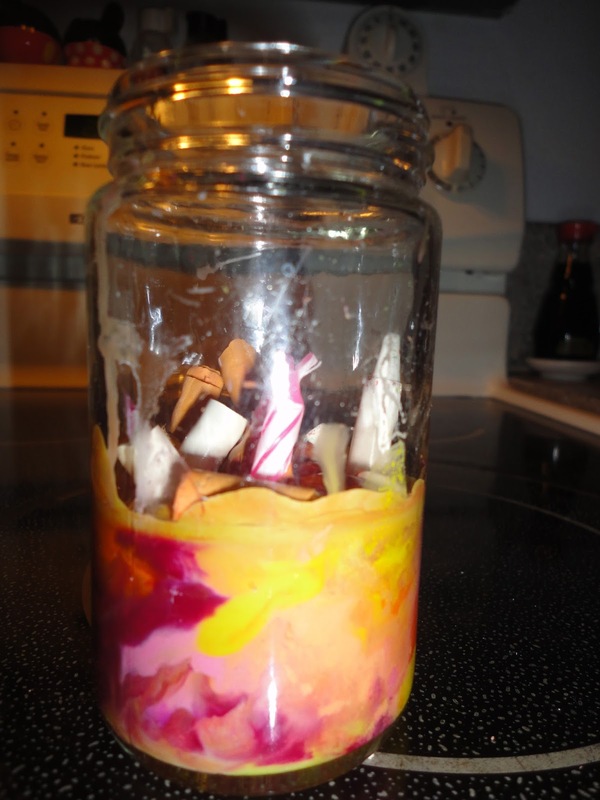 It also smells like crayons when it melts (no kidding!) so if you don't like that smell, maybe this isn't for you! So I hope you enjoyed this DIY! If you try it, make sure to email me some pictures and leave a comment below if you like these DIY posts!